‘Radar Reports’ series, Anoop Kumar reports on how millions of visually impaired Indians are now struggling as a result of the government’s short sighted coin minting project. How does a blind or partially sighted person ensure they’ve paid the right amount for the bus? Or not been ripped off whilst paying for their shopping? Negotiating basic daily transactions has become much more complex for the millions of visually impaired people in India since new Rupee coins were issued by the Indian government in 2006. There are many ways to identify the value of the coin in your hand without being able to see it: you can weigh it up for size, thickness, shape and weight, or run your fingers over its surface to feel for patterns, grooves or embossed pictures. Indeed, visually impaired Indians such as myself relied on these features to identify the coins that we had in our pockets. 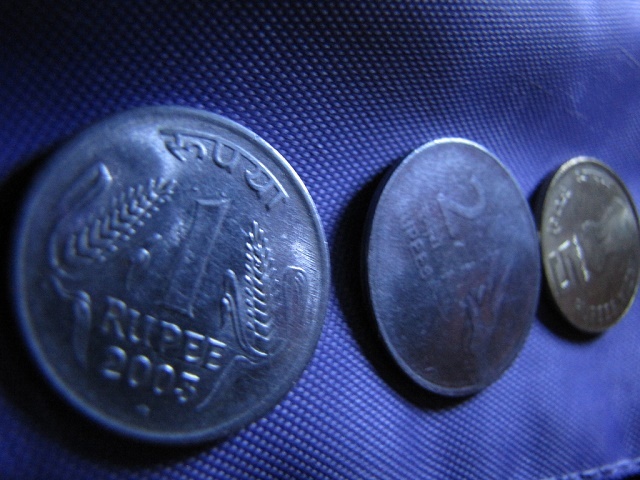 The old 1 Rupee coin, for example, was easy to identify as the circumference of the coin was plain, whilst the circumference of the 2 Rupee coin had edges and vertices. The 5 Rupee coin was heavier and thicker than all other coins. However, since the Indian government issued new coins, this has no longer been possible. The difference between the weight, size, thickness and circumference of the new coins is so negligible that it is extremely difficult for a blind person to work out which coin is which. Being in control of your own finances is crucial to maintaining independence. Blind people have come up with many ingenious techniques to speed up identifying currency, such as folding notes into different shapes and sizes or dividing up wallets with a pocket for each type of note. Indian notes are different sizes, so I measure them in order to know the value. Visually impaired people like Prince, Glover and myself now have to rely on the trustworthiness of other people in the street, or enlist the help of friends and family. Even then, being unable to identify the value of our coins leaves us increasingly prone to losing money because we’ve made a mistake or been cheated. It would seem that the government’s decision to change the coins in India was made without keeping the blind community in mind, and has inadvertently had a massive impact on our ability to buy, sell and travel independently. Whilst most Indians have seamlessly adapted to the new currency, it has caused a noticeable regression in living standards for the visually impaired. Anoop Kumar is a visually impaired Radar reporter from Delhi. It is so sad reading this article…!! I dont believe Indian Government totally neglected the blind community. Independence, of all sorts, especially financial is a must and a divine right of any individual. This is a very sorry state indeed.. coins of India should come with significant identification marks so that the visually impaired can differentiate between coins of various denominations.